← Et tu, GoDaddy? Is nothing safe from hackers? Steve Jobs will announce the iPhone 5 posthumously. Today, all the speculation about the iPhone 5 comes to an end. Around 1 o’clock this afternoon, Apple will unveil the device, which many, including myself, have been eagerly anticipating. Rumors about the screen size, location of speakers and headphone jack, retina display, processor, native map functionality, and the host of other features, will all be put to rest. And the latest iteration of the iPhone will be here. Analysts predict that millions of iPhones will be pre-ordered. And when the phone hits stores, Apple fans will (once again) rush to stand in long lines to be among the first to own the device. But for today, it’s all about the unveiling. The “one more thing” moment. In Apple keynotes of old, Steve Jobs was famous for unveiling all the rich and dynamic features of the products being introduced. Just when you thought it was over, and there was nothing more fabulous that Apple could announce, Jobs would say (something like) “Oh yeah. There’s one more thing.” and proceed to wow the audience with another product or feature that was truly astounding. That “one more thing” announcement has become the high point of Apple press events. So much so, that a fair amount of speculation goes into trying to figure out what else Apple has in store for us. Some surmise that they’ll announce the new iPad Mini. But that theory falls short as few believe that Apple would steal the iPhone’s thunder by introducing another highly anticipated device. Others think they’ll unveil a new-and-improved Siri – one that actually recognizes the user’s voice. But there’s no punch to that advancement, and it’s certainly unworthy of a “one-more-thing”. Many feel that there won’t be a “one more thing” moment. Since Steve Jobs passed, Apple keynotes have been devoid of that signature statement. Sure, the devices are cool and all, but their product releases have lacked the panache of old. If only they could do something to spice them up. The “one more thing” moment of this keynote could be Steve Jobs! What if the iPhone 5 has a 3D feature that projects images and they use it to project a holographic image of the former icon? How cool would it be to have the hologram Steve Jobs onstage? 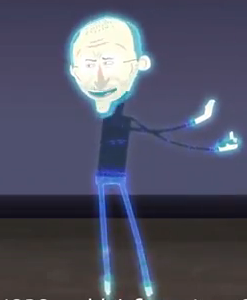 Note: I created this post before I learned that there was actually already a meme of a rapping holographic Steve Jobs.